The New Rugby Africa Gold Cup perpetual trophy – a Rugby World Cup qualifier – was officially unveiled Tuesday at the International Sports Press Association (AIPS) Congress in Brussels by Abdelaziz Bougja, Chairman of World Rugby's African association, Rugby Africa (www.RugbyAfrique.com), and by Nicolas Pompigne-Mognard, Founder and CEO of APO Group (www.APO-opa.org), the main Official Partner of Rugby Africa. The unveiling ceremony was attended by Gianni Merlo, President of AIPS and by Mitchell Obi, President of AIPS Africa, and took place in front of an audience of more than 400 sports journalists gathered in Brussels for the AIPS Congress, the largest sport media events worldwide. Handmade by Swatkins (www.Swatkins.com), Great Britain’s leading Trophy, Award and Silverware manufacturer since 1898, the Rugby Africa Gold Cup is a magnificent Gold Plated Perpetual Trophy Cup, designed and crafted with elegance, prestige and beauty. Standing at a height of 47 centimeters (18.5 inches) and weighing 3.3 kilograms, this Supreme Award features a smooth Georgian bodied design, complete with delicately patterned handles, an impressive stepped lid that is supplied complete with a circular solid African Mahogany base – this Trophy Cup is a pure masterpiece. The Trophy has been expertly engraved with the text ‘Rugby Africa Gold Cup’ and has the shape of Africa in pride of place on the main body. To complete, on the gold plated plinth band this holds the names of the 17 previous winners. It's estimated there is enough space for – at least – seventy (70) more winning teams' names to be engraved on the base of the perpetual trophy. 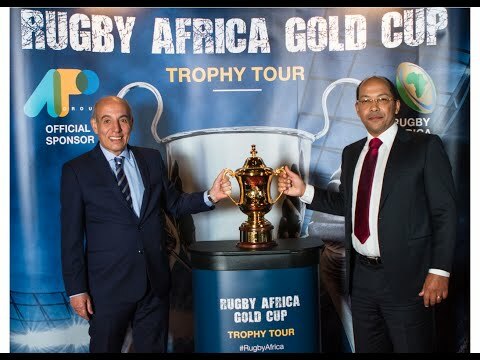 The New Rugby Africa Gold Cup perpetual trophy has been created to embody with elegance and beauty, rugby’s values of Integrity, Respect, Solidarity, Passion and Discipline which inspire millions of people to play this game. The Rugby Africa Gold Cup flight case has been especially designed by Flightcase Warehouse, Great Britain’s leading flight case manufacturer. The fully custom Spider Flight Case has been designed with strength and durability in mind. It is a strong and lightweight 7mm Astroboard flight case construction, complete with Steel corners and aluminum extrusions, filled with internal padding foam, with a cut to shape outline of the Trophy. There is a personalized aluminum plate on the Trophy Flight case with engraving “Rugby Africa Gold Cup”. Speaking at the unveiling, Abdelaziz Bougja, Chairman of Rugby Africa, said: "The Rugby Africa Gold Cup trophy is the highest reward for any African rugby player and presenting this most symbolic perpetual trophy for the first time at the International Sports Press Association’ Congress and the European capital is an amazing experience in the lifetime. This perpetual trophy will honor African rugby players for generations to come. A special thank you to APO Group and its Founder, Nicolas Pompigne-Mognard, for providing us with such an iconic piece”. Nicolas Pompigne-Mognard, Founder and CEO of APO Group, the main Official Partner of Rugby Africa, said: “We couldn’t dream of a better opportunity than the AIPS Congress to reveal the trophy. Being able to unveil the trophy during the largest sport media events worldwide, not only enhance the visibility of African rugby but also continue to grow the Rugby Africa identity across the world. This event marks the beginning of a great competition season”. Symbolizing the victory and the access to the Rugby World Cup 2019, the trophy will be awarded to the winner of this summer’s Rugby Africa Gold Cup following the tournament final on August 18 in Kampala, Uganda. The champion will depart for Japan to compete against the very best rugby teams, realize their potential and step up to the global stage. The Rugby Africa Gold Cup will kick off in Windhoek, Namibia at Hage Geingob Rugby Stadium on June 16. The summer tournament from June 16th to August 18th will bring together an impressive line-up of rugby players. Rugby is the fastest-growing sport in Africa. In 2002, only six African countries were playing the game, and now Rugby Africa boasts 38 countries. Out of 105 countries playing rugby competitively, one-third are African countries. Created in 1986, Rugby Africa (www.RugbyAfrique.com), previously the African Confederation of Rugby (Confédération Africaine de Rugby - CAR), is one of the six regional associations composing World Rugby (www.WorldRugby.org), the international organisation responsible for the governing of Rugby Union and Rugby Sevens. Rugby Africa unites all of the African countries which play rugby union, rugby sevens, and women’s rugby. 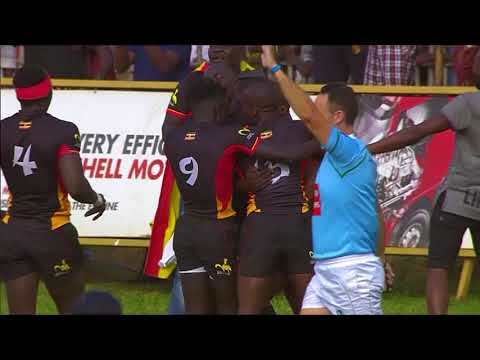 Rugby Africa organises the Rugby Africa Gold Cup, the qualifying competition for the Rugby World Cup 2019, and Africa 7, a qualifying competition for the Olympic Games 2020. Rugby Africa has 38 members, including 22 members and associated members of World Rugby, 10 members and associated members of Rugby Africa and 16 new countries collaborating with Rugby Africa. New Rugby Africa Gold Cup’s perpetual trophy – a Rugby World Cup qualifier – unveiled today at International Sports Press Association (AIPS) Congress in Brussels Symbolizing the access to the Rugby World Cup 2019, the trophy will be awarded to the winner of this summer’s Rugby Africa Gold Cup CAPE TOWN, South Africa, May 28, 2018/APO Group/ -- The New Rugby Africa Gold Cup perpetual trophy – a Rugby World Cup qualifier – was officially unveiled Tuesday at the International Sports Press Association (AIPS) Congress in Brussels by Abdelaziz Bougja, Chairman of World Rugby's African association, Rugby Africa (www.RugbyAfrique.com), and by Nicolas Pompigne-Mognard, Founder and CEO of APO Group (www.APO-opa.org), the main Official Partner of Rugby Africa. Free Broadcast quality B-Roll footage are available for media to download: https://goo.gl/icfzx8 Photos: https://we.tl/fQkPlZ9OgE Sound bites: https://we.tl/aRmC4JxFtS The unveiling ceremony was attended by Gianni Merlo, President of AIPS and by Mitchell Obi, President of AIPS Africa, and took place in front of an audience of more than 400 sports journalists gathered in Brussels for the AIPS Congress, the largest sport media events worldwide. Handmade by Swatkins (www.Swatkins.com), Great Britain’s leading Trophy, Award and Silverware manufacturer since 1898, the Rugby Africa Gold Cup is a magnificent Gold Plated Perpetual Trophy Cup, designed and crafted with elegance, prestige and beauty. Standing at a height of 47 centimeters (18.5 inches) and weighing 3.3 kilograms, this Supreme Award features a smooth Georgian bodied design, complete with delicately patterned handles, an impressive stepped lid that is supplied complete with a circular solid African Mahogany base – this Trophy Cup is a pure masterpiece. The Trophy has been expertly engraved with the text ‘Rugby Africa Gold Cup’ and has the shape of Africa in pride of place on the main body. To complete, on the gold plated plinth band this holds the names of the 17 previous winners. It's estimated there is enough space for – at least – seventy (70) more winning teams' names to be engraved on the base of the perpetual trophy. The New Rugby Africa Gold Cup perpetual trophy has been created to embody with elegance and beauty, rugby’s values of Integrity, Respect, Solidarity, Passion and Discipline which inspire millions of people to play this game. The Rugby Africa Gold Cup flight case has been especially designed by Flightcase Warehouse, Great Britain’s leading flight case manufacturer. The fully custom Spider Flight Case has been designed with strength and durability in mind. It is a strong and lightweight 7mm Astroboard flight case construction, complete with Steel corners and aluminum extrusions, filled with internal padding foam, with a cut to shape outline of the Trophy. There is a personalized aluminum plate on the Trophy Flight case with engraving “Rugby Africa Gold Cup”. Speaking at the unveiling, Abdelaziz Bougja, Chairman of Rugby Africa, said: "The Rugby Africa Gold Cup trophy is the highest reward for any African rugby player and presenting this most symbolic perpetual trophy for the first time at the International Sports Press Association’ Congress and the European capital is an amazing experience in the lifetime. This perpetual trophy will honor African rugby players for generations to come. A special thank you to APO Group and its Founder, Nicolas Pompigne-Mognard, for providing us with such an iconic piece”. Nicolas Pompigne-Mognard, Founder and CEO of APO Group, the main Official Partner of Rugby Africa, said: “We couldn’t dream of a better opportunity than the AIPS Congress to reveal the trophy. Being able to unveil the trophy during the largest sport media events worldwide, not only enhance the visibility of African rugby but also continue to grow the Rugby Africa identity across the world. This event marks the beginning of a great competition season”. Symbolizing the victory and the access to the Rugby World Cup 2019, the trophy will be awarded to the winner of this summer’s Rugby Africa Gold Cup following the tournament final on August 18 in Kampala, Uganda. The champion will depart for Japan to compete against the very best rugby teams, realize their potential and step up to the global stage. The Rugby Africa Gold Cup will kick off in Windhoek, Namibia at Hage Geingob Rugby Stadium on June 16. The summer tournament from June 16th to August 18th will bring together an impressive line-up of rugby players. Rugby is the fastest-growing sport in Africa. In 2002, only six African countries were playing the game, and now Rugby Africa boasts 38 countries. Out of 105 countries playing rugby competitively, one-third are African countries. Distributed by APO Group on behalf of Rugby Africa.